I recently lost someone who, even though I hadn’t seen him in 7 years, was very important to me – my friend Hiro’s father, my “Japanese father,” Minoru Yasuda, died in October 2014 at the age of 74. 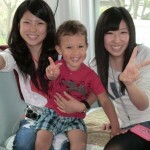 I met Minoru and his wife Eiko and their son Yoshi when I was teaching English in Japan. I had become friends with their oldest son, Hiro, when he was studying ESL at my university in America, and I had met Hiro by signing up to be a conversation partner for the ESL program. Hiro was immediately a really impressive guy and we quickly became good friends, despite the language barrier – we hung out and went out to dinner together with a big group of diverse/international friends. Hiro was still halfway through his year in the U.S. when it was time for me to fly to Japan to start my year of teaching English on the JET Program, but even though we were not together in the same country, Hiro asked his best college friend Satoru and their entire circle of friends back in Tokyo to take me under their wing and show me around and take good care of me while I was living in Japan. Satoru arranged a meeting for me with Hiro’s father, who had asked to meet me for dinner. The first time I met Minoru Yasuda was early in my time in Japan – it must have been early August 2001, and it was a hot, humid Tokyo night. I got off the train at Ikebukuro station and there was a driver waiting for me – Minoru had ridden to pick me up in a chauffeured car. The driver whisked us off through the neon lights of Tokyo and Hiro’s father took me out for dinner at a really amazing sushi restaurant – one of those hole-in-the-wall places that only seats 8 or 10 people, and you’d never be able to find it unless someone who had lived in Tokyo for years took you there, and even though it’s a tiny, out-of-the-way restaurant, somehow the food immediately ranks among the Top 5 greatest meals of your life. That was one of the things about the restaurant culture of Tokyo that I never understood – there are so many amazing restaurants in Tokyo where the owners, despite making world-class food, apparently have no ambition to expand or franchise or serve more than 10 customers at a time. They’re content to do this one specific thing (sushi, or ramen, or curry, or soba) and do it really, really, really well, with exacting precision honed over many years of rigorous study and practice. Minoru had never been to America, but he was a big fan of American culture, American big band jazz, and American movies. He loved to drive around Tokyo in an old Thunderbird, even though it cost him dearly on upkeep and extra taxes (in Japan, the tax system is geared toward incentives to buy new cars – so you rarely see any beat-up old cars in Japan, let alone a beat-up Thunderbird). I remember sitting in their living room with him, drinking sake and watching “The Secret Life of Walter Mitty” (the original version with Danny Kaye). Minoru used to love Danny Kaye’s facial expressions; he would laugh and point at the screen and say, “Ha ha – look! Look at his face!” He was a big fan of Dean Martin, too. 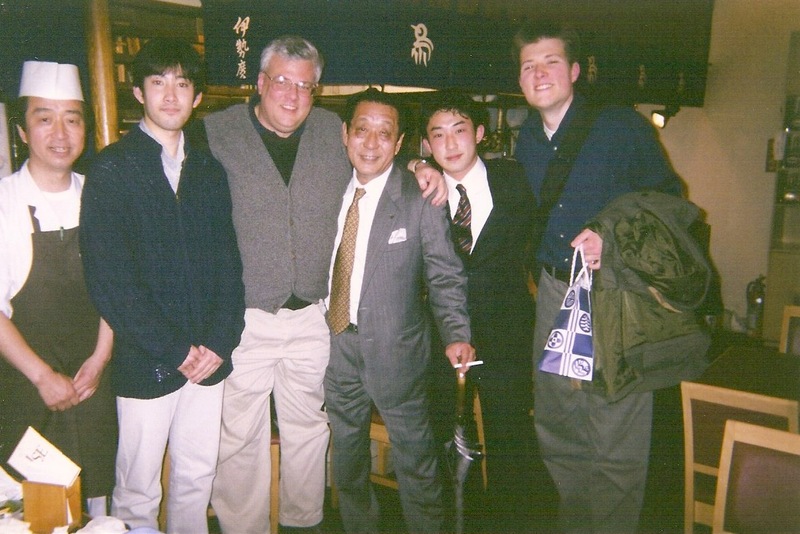 I came to think of Minoru as being a kindred spirit to “the Rat Pack:” he loved to smoke, he loved to have a good time and enjoy good beer and spirits, and unexpectedly enough, I soon found that my friend Hiro’s 62-year-old father was one of my favorite people to hang out with in Japan. I cannot begin to sufficiently express my gratitude for how hospitable and generous Minoru and Eiko were to me. 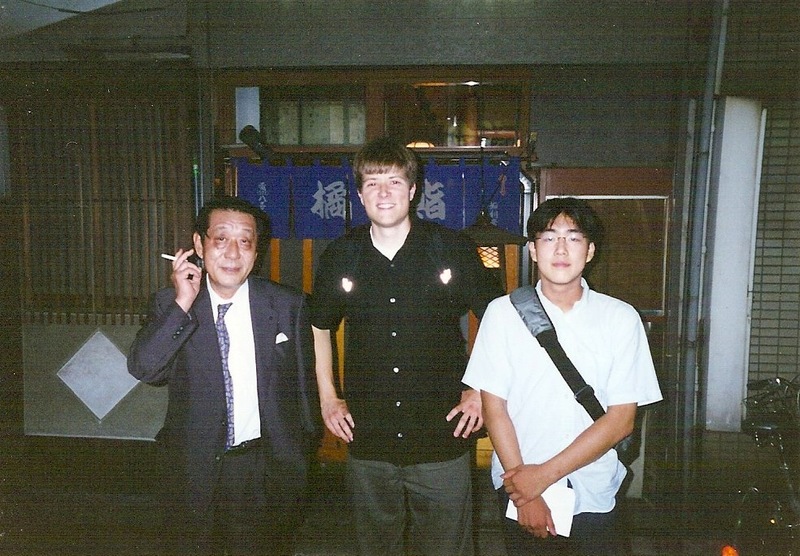 I was a young guy living in Japan teaching English, I spoke very limited Japanese, and I really didn’t know what I was doing from a cross-cultural standpoint – I probably committed lots of social faux pas – but they welcomed me into their home and kept inviting me over for dinner and always made me feel like an honored guest. Eiko made the most delicious dinners for me. (She spoke not a word of English but instead of chatting she always smiled at me and then disappeared to the kitchen and served us mind-blowingly delicious home-cooked Japanese food.) Minoru always would pull out a bottle of excellent sake or champagne and we’d eat and drink and watch the Yomiuri Giants (Tokyo’s most popular baseball team) play on TV. Living in another country where you don’t speak the language, living in your own apartment by yourself for the first time, cooking for yourself for the first time, can all be tiring and stressful – and whenever I was at Minoru and Eiko’s house I always, every minute, felt very well taken care of and very much at home. 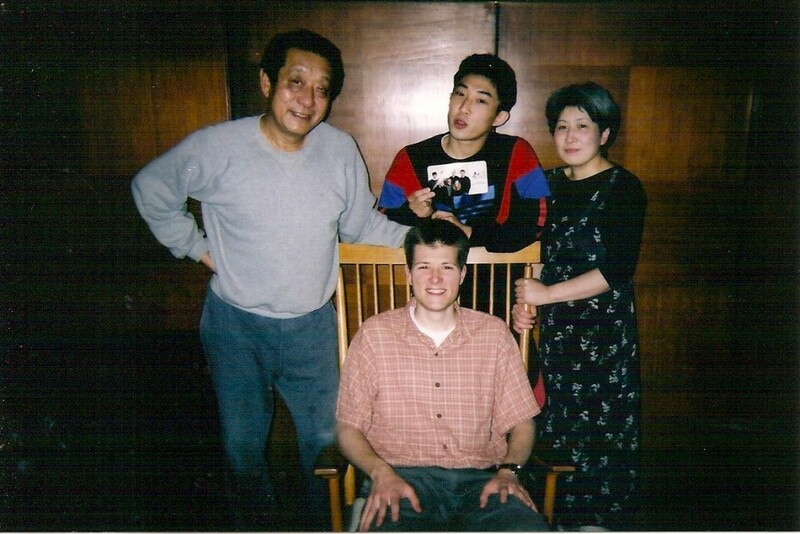 Hiro’s younger brother Yoshi (shown with me and Minoru in the photo above) was living at home with his parents – he had graduated from high school but had not passed the college entrance exam, so he’d had to take a year off to prepare once again to take the entrance exam. (The Japanese college admissions system is a bit more rigid than America – if you don’t get accepted by the college of your choice, you can’t just go to community college instead for a year or two; it’s kind of all-or-nothing.) Yoshi spoke very little English and was very shy around me, but Minoru was always trying to coax Yoshi into being more outgoing and talking more. Again, Minoru and Eiko were not at all the classic stereotype of strict, overbearing, achievement-obsessed Japanese parents – even though Yoshi had missed his first chance to go to college and was kind of at loose ends for a year, they were really laid-back about it, and were just happy to have the unexpected opportunity to spend lots of time with their son. “Yoshi is a, how you say in English? Good boy. He is a GOOD boy,” Minoru said, taking another puff of his cigarette. Then he would mockingly pretend to play the part of the “strict Japanese father” and fake-harass Yoshi to try harder with his studies. “Yoshi?” he would say, shaking his fist, “You MUST study. You have NO CHOICE!” And we’d all laugh. Minoru also took us all out for lunch at his favorite yakitori (grilled chicken) restaurant that he had been patronizing for 40 years – with the same chef, who he referred to by the familiar name of “Ken-chan.” This was a really amazing yakitori restaurant. The only thing on the menu is chicken – nothing else – but they use every single part of the bird’s body. Flesh, bones, hearts, lungs, gizzards, livers – all salted and seasoned and prepared meticulously and exactingly to squeeze out every subtle nuance and flavor. Again, it was one of the Top 5 meals of my life. Out of the Top 5 meals of my life, two of them were thanks to Minoru Yasuda. “Ben,” Minoru would tell me, “Sometime, if you like, you can go to Ken-chan’s chicken barbecue restaurant, and you can say, ‘Ken-chan! Send the bill to Mr. Yasuda.’ And bring your best girlfriend! But…you can only do this ONE TIME. Any more than that, and I will become VERY ANGRY.” And he would fold his arms and give me a mockingly “stern Japanese father” face – he was so funny, I’m laughing right now just as I’m typing this. I remember that after the yakitori meal, Minoru had us over to the house, and he subtly-yet-strongly suggested that because of his busy travel schedule, maybe my dad would like to take a nap. So they had my dad go lie down by himself in a separate bedroom on a futon, and even though my dad felt kind of sheepish about it (he never wants to make a scene or get any special treatment for himself), he immediately dozed off. My dad later told me that it was one of the best naps he’d had in a long time. That’s the kind of hospitality Minoru specialized in – he had this force of personality where he somehow encouraged you to try the food, try the sake, take a nap, have the experience that you maybe didn’t even realize you needed, but were grateful to have had. The last time I saw Minoru was in 2007 when my wife and I made a visit to Tokyo. At the time, he had been having some health problems and was in the hospital (the same hospital where President George H.W. Bush was taken in 1992 after vomiting on the Japanese Prime Minister – my friend Hiro showed us the commemorative plaque in the hospital lobby). I was sorry that he wasn’t feeling well and that we didn’t get to spend much time with him, but I was glad to see him again and I was glad that he got to meet my wife. My wife and I have often talked during the past few years about how we’d like to take our kids on a trip to Japan someday, and how we would have liked for Minoru to get to meet our kids. I’m sorry that now, that will not be able to happen. I heard from my friend Hiro and his wife Nanae about the death of Minoru in October. Nanae said that 400 people attended the funeral wake for Minoru, and it’s clear that he really touched a lot of people’s lives. He had such a warm heart, and he had fun every single day. He lived life the right way! Hiro and Nanae live in London now – Hiro became fluent in English (he always used to tell me, “I owe my English to you, Ben!”) and got transferred abroad by his Japanese company – and they have two young boys, just like my wife and me. Minoru was always incredibly proud of Hiro, and I’m sure he was especially proud to have his son achieve fluency in English and be able to qualify to work abroad. Hiro is a really hard-working guy who’s an up-and-comer at his Japanese company, and he works really long hours in the City (London’s “Wall Street”), but he’s always been such a great guy and I’m sure he’s still the same energetic, charismatic, generous, funny, open-minded and capable leader that I remember from when we were in college. 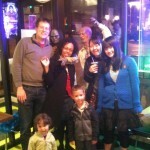 I hope to see Hiro again someday soon so we can drink a cup of sake in honor of his father’s memory. It took me awhile to get to the point of being ready to write this little remembrance of Minoru Yasuda. 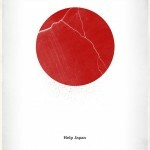 I cannot imagine a better host, father, “Japanese father,” or ambassador for the very best of Japan’s cultural values. I’m grateful to have known him. He made a big difference in helping me have a great experience in Japan, and I wish everyone who studies abroad or travels abroad or lives in another country could have someone like Minoru to laugh with and learn from. Minoru Yasuda, rest in peace! You will be fondly missed and long remembered – all over the world.